Back to school ... I know, cheer up -it won't hurt too much. It's been a while since I posted as I was on vacation and only just got back to teach winter camp. 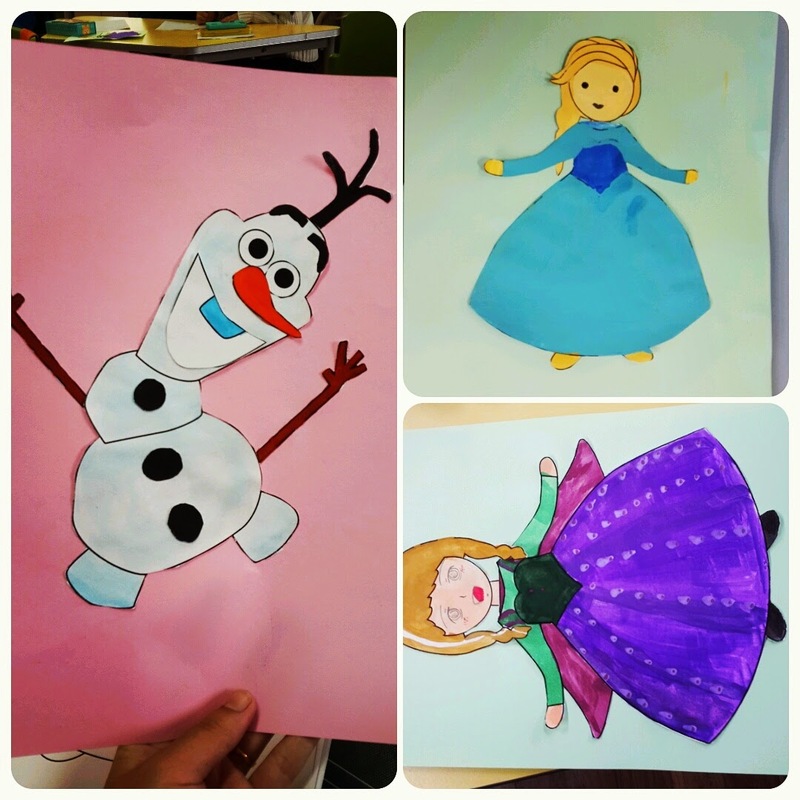 As mentioned in my previous post, I chose to do a Frozen movie theme as I wanted an easy to prepare camp and Frozen has been such a global hit that I thought, why not use all those pre-made resources to my advantage? So, there were definitely a few changes to my camp once in action. My plan became a very loose list of things I may or may not do ...that's what happens a lot when you're a teacher. You plan and think it'll work exactly to that effect, but things always seem to change themselves round especially when working with 7-10 year olds! 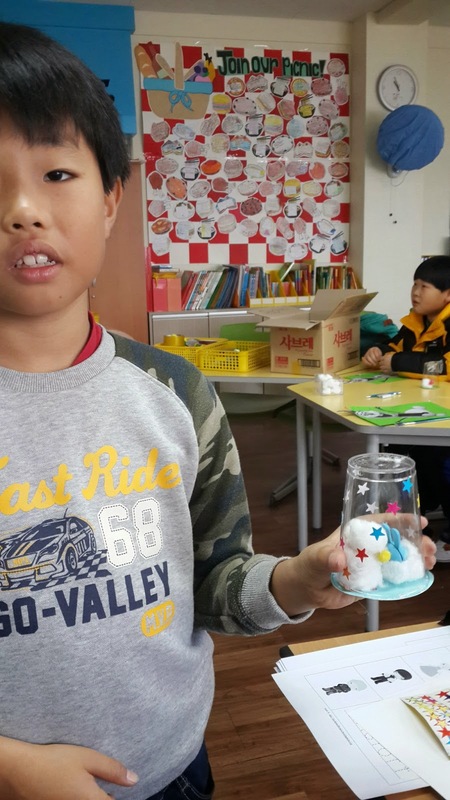 The crafts I stuck to went really well but I scraped the frozen princess and making snow experiment as the materials and timing just didn't allow it. Also, I scraped the jelly sundaes (I know, sad!) but my kids were on too much sugar as is, so I didn't think it necessary to overload them further. Now I've got all this jelly (jello) but I'll find a class to use it for some day. The plastic cup snow globes! I'd totally do this again. 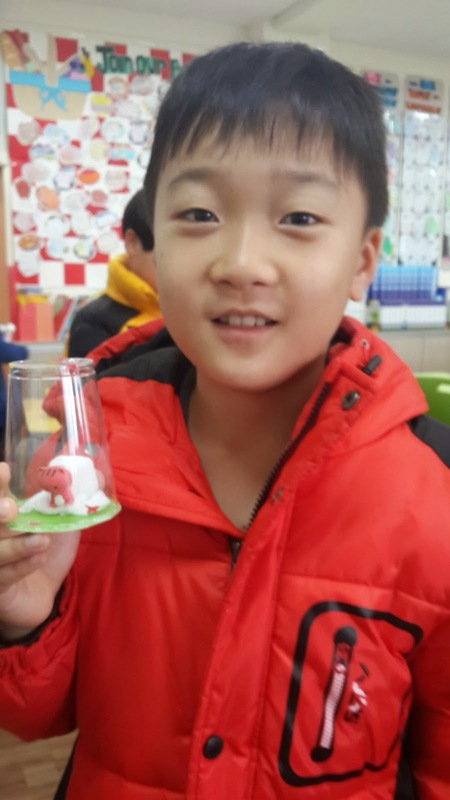 What was really funny was that my coteacher got some little animal toys for the kids to stick inside their globes - except they weren't winter type animals at all, more like lions, hippos, rhinos and gorillas which meant we made, more like, 'jungle globes/ safari globes' instead. But nevertheless, the kids had fun. So easy to make and you can use just about anything you have on hand to decorate the inside of the 'globe'. The powerpoint presentation to go with this is free to download. Both grade levels enjoyed painting immensely. It made for a chill class for about 40 minutes. 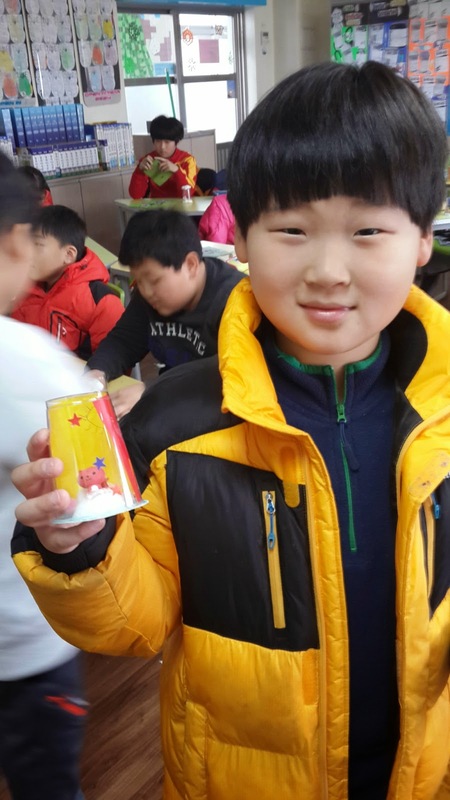 They all got a little selection of paint that we squeezed out for them on plastic hand fans (recycling!) and sat and painted their characters quietly. They look awesome. Download link. After painting they cut them out and stuck them on to coloured paper. They looked really good. I was impressed. These went well and the kids really enjoyed it -the making and eating. 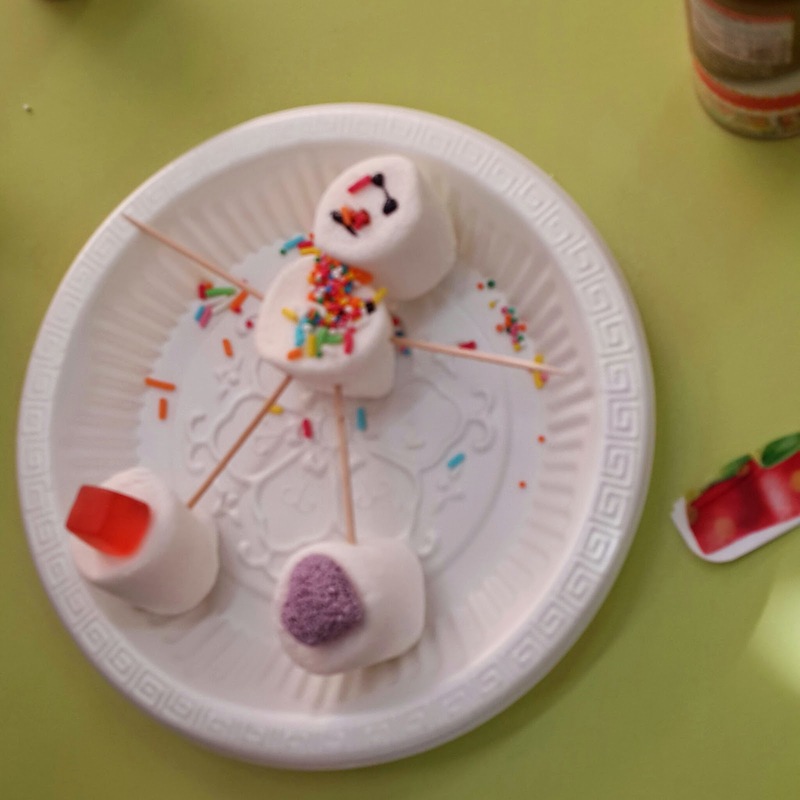 I gave them 4 fluffy white marshmallows each and had some coloured icing that I put into ziplock bags then cut tiny holes on the corner so they could pump out the icing like a pen and draw the snowman features. We also had some jelly candies for buttons, and sprinkles. 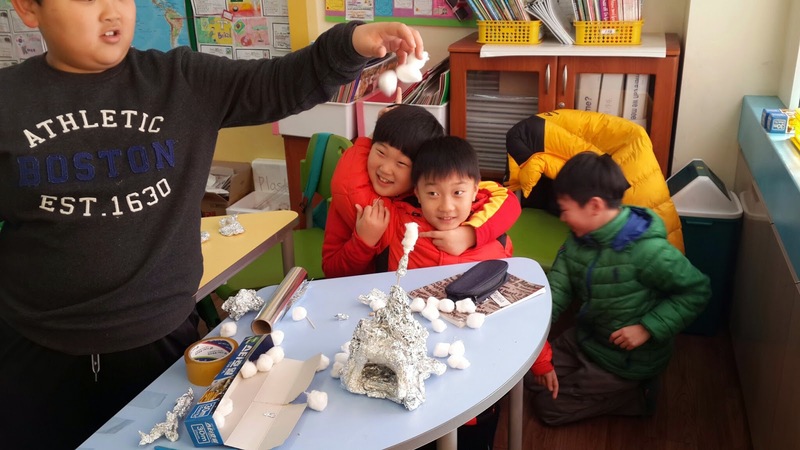 Toothpicks were given to stabilize their snowmen. It was yummy - I made and ate my own too. These went really well and the white chocolate was addictive...too addictive. 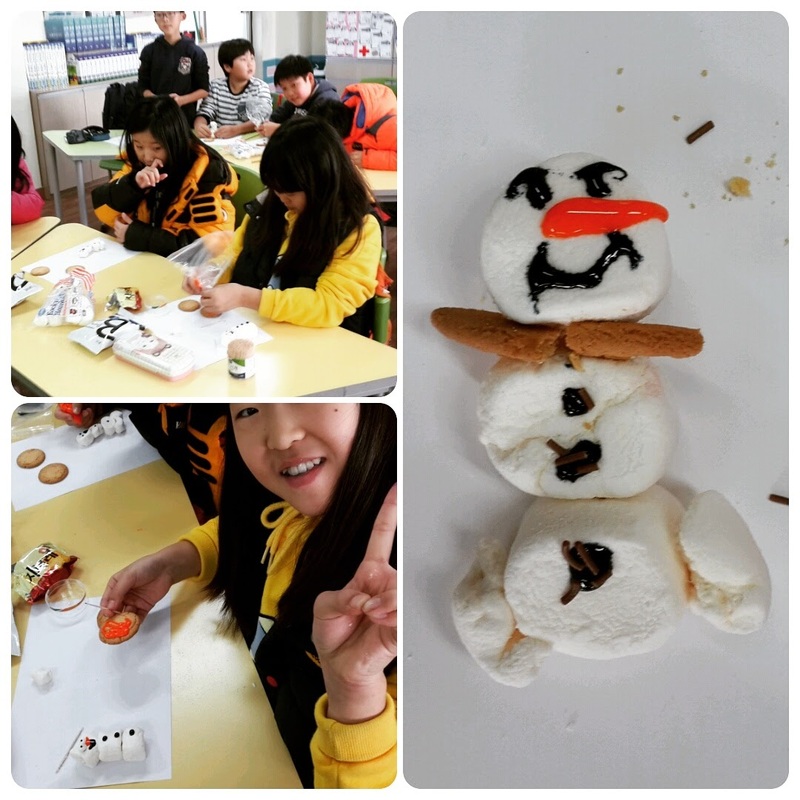 It was a simple food activity that the kids enjoyed. I melted white chocolate simply by boiling water in a kettle then in a small pot I poured the boiled water in then placed a glass bowl over the top of the pot with water inside and melted the chocolate slowly in the glass bowl. It melted in about 10 minutes, so we sang songs and got our desks ready within that time. 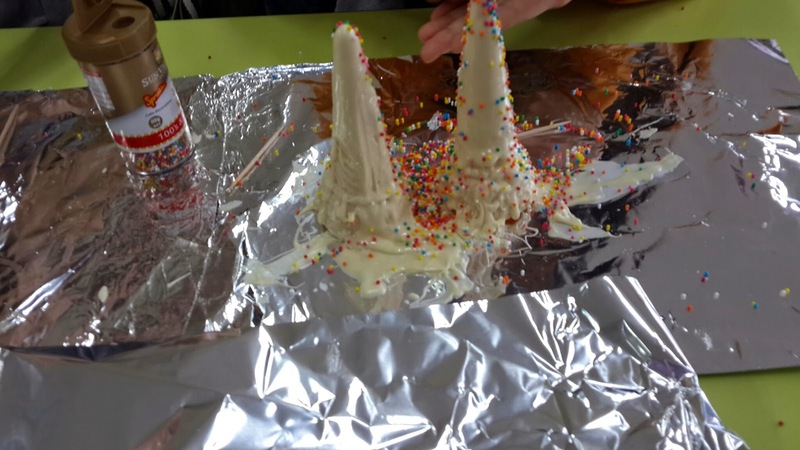 We also had whipped cream in a can that the kids sprayed on to their trees and I had lots of sprinkles to decorate. One day I'd like to try colouring the melted chocolate blue or pink, etc...oh and the 'tree' is made by using an ice cream cone. 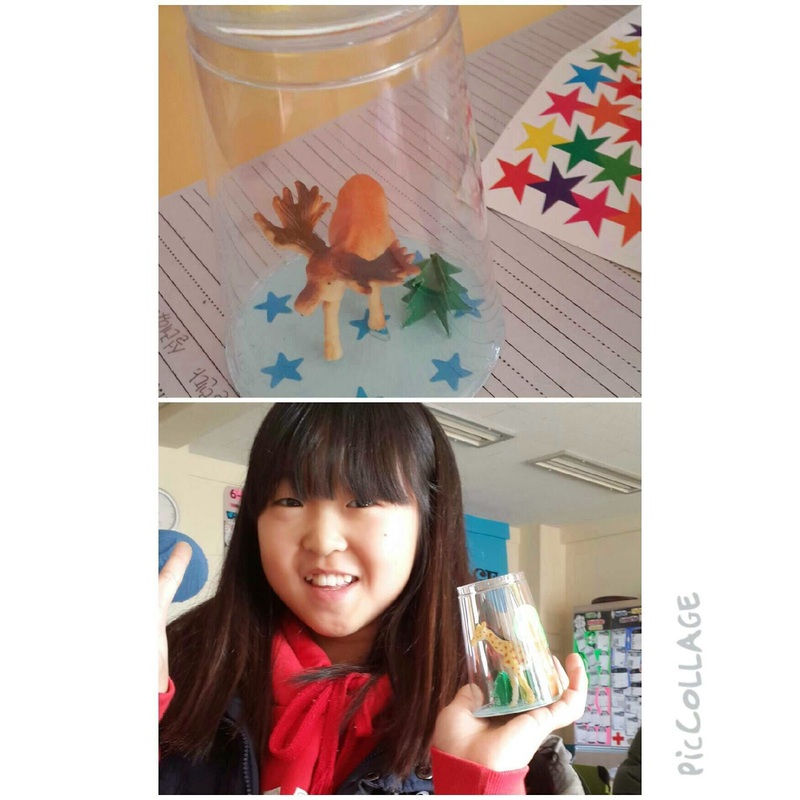 This activity went well with the grade 5 & 6 however, the grade 3 & 4 were amazing! 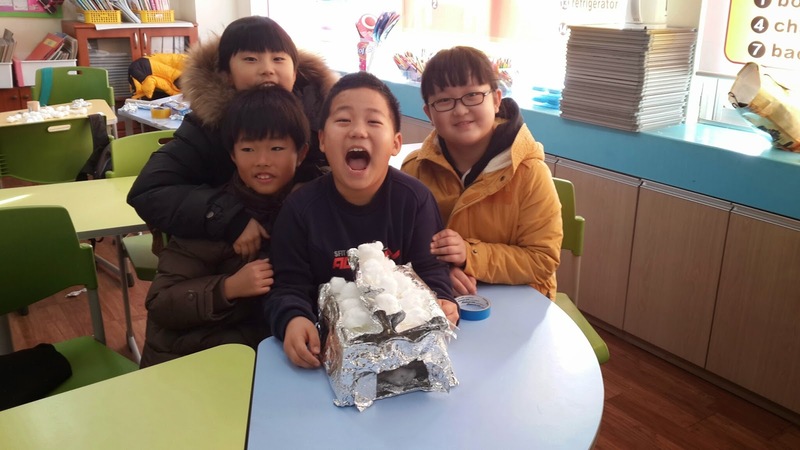 The little ones put a lot more effort into their designs and got really excited as time was nearing to an end. It was super easy to prepare. We just gave out tin foil, cotton balls, toothpicks, scissors and tape. 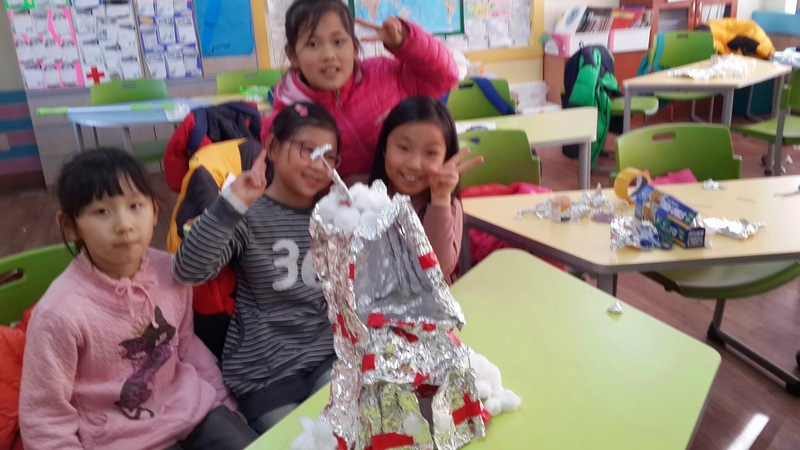 They were told they had 15 mins to create Elsa's palace and they did it very well. Would totally do this again for another camp. I gave everyone a treat for creating such wonderful designs. They did well. Of course the musical number game was a hit. They loved it. We played a musical game or two every day at the end of lessons to get them to leave in a happy mood. It was fun to see them dancing and laughing. Musical chairs also went well and I made it more English based by first writing the vocabulary "spin, jump, clap, slow motion and squat" on the board. We went over the meanings of the verbs which they mostly knew already, then when the music played I'd call out these verbs and they would have to act them, the rest of the game was played the same as the classic musical chairs we all know. "Elsa, Elsa, Olaf!" was just my Frozen movie version of 'duck, duck, goose'. Do you know it? It's when the kids get in a circle then one child taps the top of his classmate's heads as he walks around the circle saying 'duck' or 'Elsa' -for my version. But the child tapping heads will choose one classmate to be 'goose' or 'olaf' and that classmate when he/she hears 'goose/olaf' they have to get up and run to catch the standing (the tapper) child. The child who was tapping has to run around the circle and sit in the empty place of the kid who is chasing him/her. 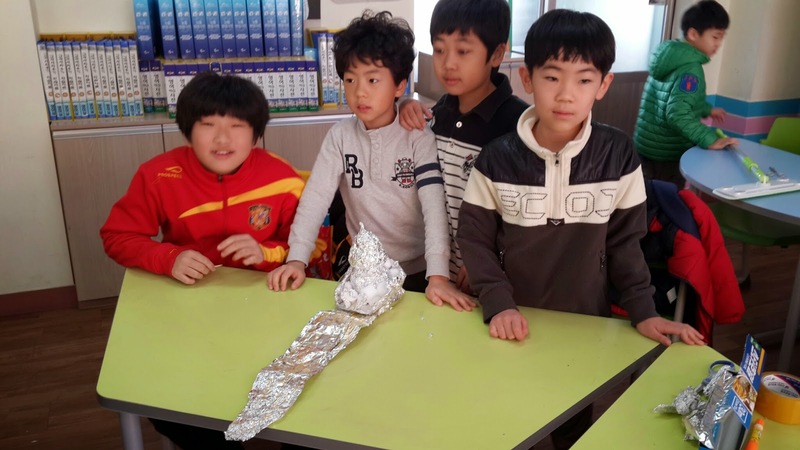 Sorry if that was hard to understand... but it's really a fun and well known game and by the looks of it, when I explained/demonstrated to my students they knew of a Korean version as well. Here's a better explanation of the game if you don't know it and can't understand mine, lol. 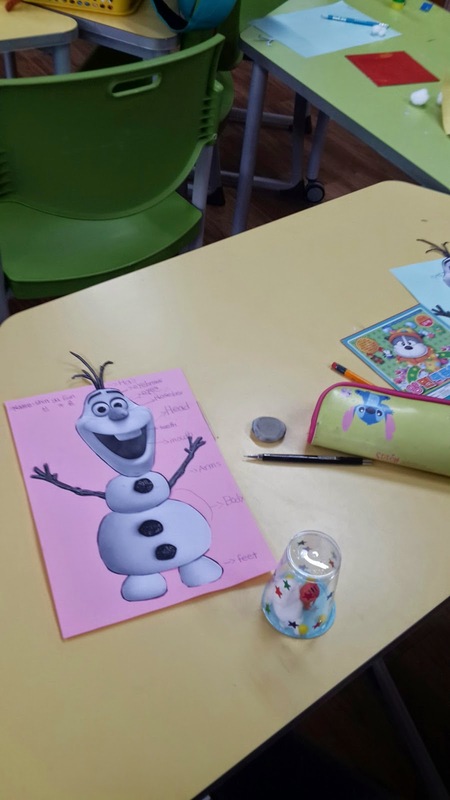 This powerpoint is a simple presentation of body parts -using Olaf the snowman! Very cute. You learn eyes, head, eyebrows, mouth, arms, body, feet and hair. 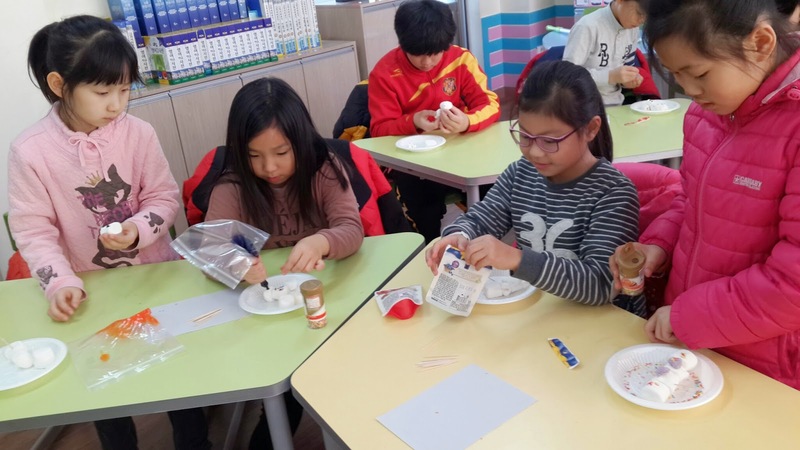 After learning - I got them to write the words in English and Korean in their notebooks, we then played a "touch your _____" game which they loved. I would be naughty and say "touch your nose" but I'd bend to touch my feet which would confuse them and catch them out for not listening properly. They loved it. I also got students to volunteer to play the instructor saying "touch your ____" and they did really well. Added bonus! 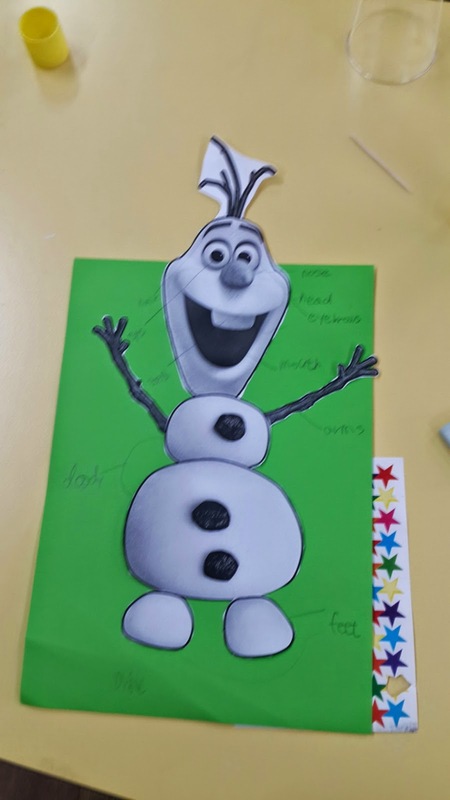 I got an Olaf cut out body worksheet where they had to cut and stick Olaf's body in the correct order and then I made them label the body parts with the new vocab we learnt. 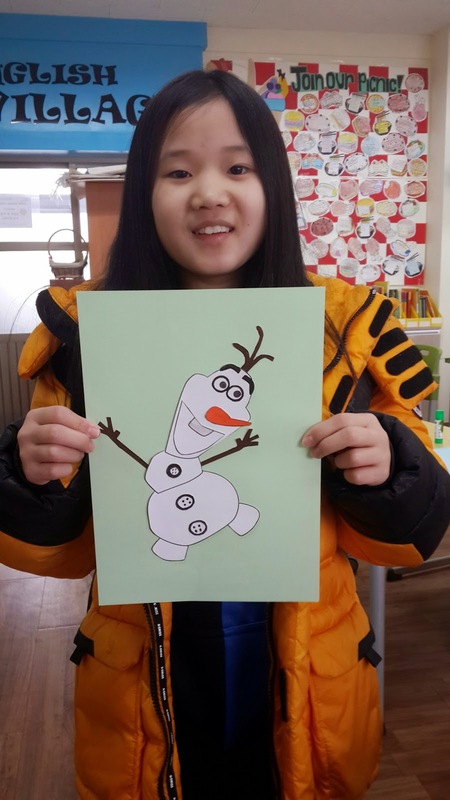 We also did 'Pin the nose of Olaf' which the kids really enjoyed also. We also did a powepoint that reviewed the words : Palace, wall, door, snow, ice which was for the day we did the building Elsa's palace activity. Here's the link. Within the powerpoint there's the 'hammer game' where the words are projected on the white board and I call them out and the students hit the correct word. I do two at a time to make it competitive. 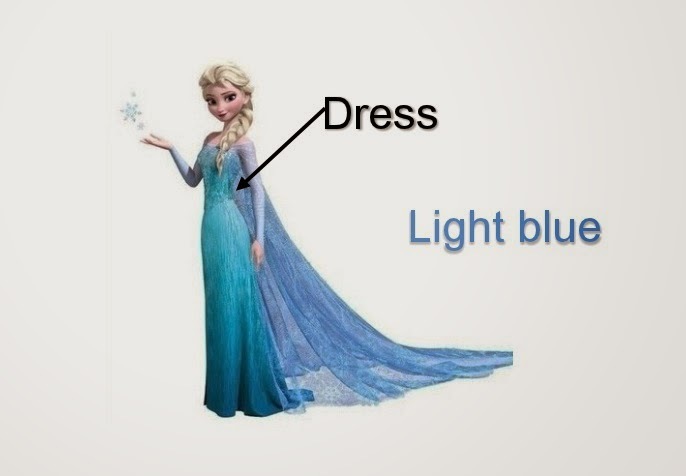 We also did a Frozen Clothing & Color powerpoint which is a basic vocab ppt of the clothing the Frozen characters wear and some colors. Vocab: dress, light blue, dark blue, gloves, black, cape, tunic, sash, red, gold, grey, green, boots, hat. This was good to do before the painting activity. New words like 'tunic' and 'sash' were interesting for the students to learn and while we went through the vocab I'd ask them to see who had light blue on or who had pink on, etc. We did the 'touch' game too, like the body parts but instead by what colour they could find and touch around the classroom. Hope you had a fab camp, and perhaps can use these in your after school classes /extra classes, summer camp, etc.